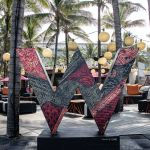 Amplifying W’s passion for design, W Bali – Seminyak is set to put a local spin on its remarkable and iconic W sign by connecting with local artists. 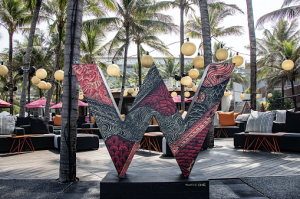 The first artist @swoofone has created ‘The Beauty of Dewata’ a reimagining of the W Sign, celebrating the W Bali 8th anniversary and integrating the local Bali culture. Created in March, the design by @swoofone is available to view at W Bali – Seminyak until the end of April. The first of its bi-monthly mural design activation at Woobar, the second series will see Bali based painter and drawer, Tracy Hamer @tracyhamerart create a new design, available to view from May to July. Design has been a key focus for W Bali – Seminyak since opening their doors eight years ago. In 2013, New York graffiti artist, Alec Monopoly used his skills and paint cans to design the hotel surroundings. Followed by a partnership with French artist, Lucas Beaufort in 2018, during, Wake Up Call; the islands 2 days music festival. Beaufort transformed the wall space into an unmistakable #WDesign with his mischievous and colorful ‘re-covers’. Born and raised in Bali, I Wayan Subudi Yadnyana A.K.A Swoofone came onto the art scene in 2015 and has never looked back. Inspired by ornamental illustrations, usually found in Bali temple architecture, Swoofone visualizes the beautiful aspects of Bali; from beaches, to flowers and even the landscapes, he then pours his visualisations onto Balinese ornaments. Tracy Hamer is a Bali based artist, painter and drawer. Hamer’s art is described as figurative; isolating specific aspects of the human figure and anatomy. For W, Hamer will create a piece that is part of an ongoing series called Gaze, pop art with a seductive glance to engage the viewer. “They say eyes are the window to the soul, so I like to stress that focal point and work with figurative elements”, comments artist Tracy Harmer.